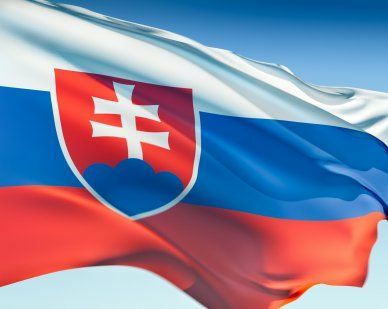 The flag of Slovakia goes back to 1938. It was flown unofficially before this date and then flown officially from 1938-1945, there was a period when it was not used, and then it reappeared in 1990. It had 3 horizontal stripes of white at the top blue in the center and red at the bottom. In 1992 the coat of arms was added in left center of the flag. This is the flag that we are familiar with today. Our top-quality Slovak Republic flags conform to all official specifications. Emblems and designs are executed with the highest possible degree of accuracy in regard to detail, color shades, placement and proportion to flag size.